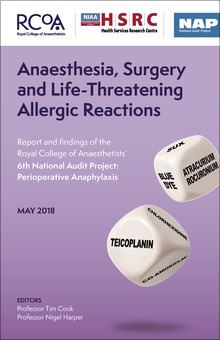 Published on 14 May 2018, the 6th National Audit Project of the Royal College of Anaesthetists (NAP6) is the largest ever prospective study of anaphylaxis related to anaesthesia and surgery. The study has taken three years and included identifying and investigating every case of life-threatening anaphylaxis that occurred in NHS hospitals during one year - from three million anaesthetics. The findings are wide-ranging and often unexpected, highlighting new trends in the drugs causing anaphylaxis and the need for changes to hospital procedures and training, combined with better reporting and investigation of incidents. Antibiotics, which the study showed are given to more than half of all patients undergoing surgery, were identified as the most frequent cause of anaphylaxis. This contrasts with previous studies, which found the main culprit to be muscle relaxants - drugs used during general anaesthesia to reduce movement. Nearly half of all anaphylaxis cases were caused by antibiotics administered to prevent surgical site infections and one-third by muscle relaxants. The authors suggest that anaphylaxis caused by antibiotics may be increasing as a result of wider use and sensitisation in the population. Significantly, the authors indicate that some antibiotic allergic reactions, including fatalities, could have been prevented. Teicoplanin was the antibiotic with the highest risk of anaphylaxis and is regularly used for patients who reported allergy to penicillin. The study found teicoplanin is 17-fold more likely to cause anaphylaxis than penicillin and similar drugs. As 90 per cent of patients who report penicillin allergy are in fact not allergic, better identification of true allergy would reduce risk. While most patients survived their anaphylactic reactions, 40 had a cardiac arrest and 10 patients died. The study found those patients at most risk of cardiac arrest or death were the elderly, patients with cardiac disease, those taking certain cardiac medicines and the obese. Another issue highlighted by the study was a low rate of involvement from independent (private) hospitals. An increasing number of NHS and other patients undergo surgery in the private sector, with a substantial proportion funded by the NHS. However, only 13 per cent of 304 independent hospitals agreed to take part in the study. This low involvement meant no formal analysis of performance in this sector was possible. This is a concern as solo anaesthetists, combined with a lack of on-site critical care facilities and integrated allergy clinics present unique challenges to clinicians of all specialties managing anaphylaxis in independent hospitals. Of concern to the authors were the long waits for patients to attend an allergy clinic - on average more than 100 days - with guidelines on wait times for first appointments regularly breached, even for patients with cancer and other urgent cases. Diagnostic testing across clinics was found to be of variable quality - sometimes preventing clinicians from identifying safe anaesthetic techniques. The study also found that communication with patients, by allergy clinics and anaesthetists could be improved. Report author Professor Tim Cook said: "More than 95 per cent of patients survive life-threatening anaphylaxis because of timely detection and prompt action by their anaesthetist and the wider medical team. However, our research highlights the importance of this topic and shows evidence of new and growing risk factors. We have identified areas where changes might reduce the risk of anaphylaxis and others where improvement is required such as during management of the most severe cases. We need to see improved reporting of these cases, better investigation after anaphylaxis and investment and expansion of perioperative allergy clinics." 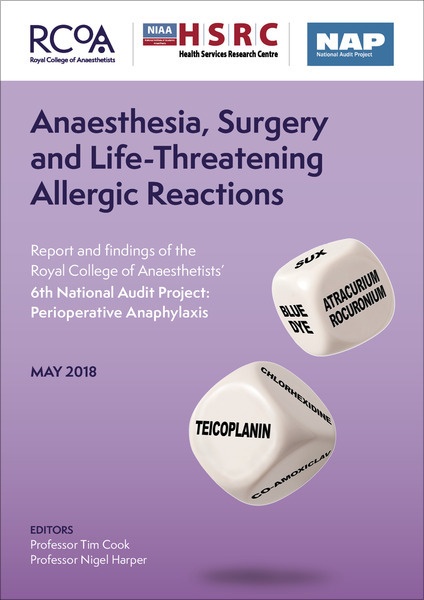 Dr Liam Brennan, President of the Royal College of Anaesthetists said: "The nature of anaphylaxis means it usually presents quickly and without warning among patients of all ages, undergoing any type of surgery or procedure under anaesthesia. This National Audit Report, like each of its five predecessors, provides invaluable information for anaesthetists on the incidence, diagnosis and management of this life-threatening complication. Importantly, this report also identifies areas where there is room for improvement in the care of our patients particularly in the investigation of the episode once the immediate crisis is over." Jan describes her feelings when, in June 2017 she experienced anaphylaxis during major abdominal surgery: "...when I came round I was uncontrollably shaking, very nauseated and feeling as if I'd been run over by a bus...There was, what seemed to be a large number of people standing around me...chattering and looking down at me...I was feeling very scared and peculiar. Something was definitely wrong." It is anticipated that NAP6 will lead to changes in the practice of individual anaesthetists, their training and hospital support systems both nationally and internationally. Click here for the full NAP6 Report. Anaphylaxis in the operating theatre is a life-threatening drug reaction that happens suddenly, without warning and can affect anyone. Low blood pressure, impaired circulation and lack of oxygen in the lungs combine to starve the tissues of oxygen, leading to shock which in extreme cases rapidly progresses to cardiac arrest or even death. More than three million anaesthetics are delivered to patients in NHS hospitals each year and the vast majority are safe and uneventful. In the United Kingdom, anaesthesia is delivered by doctors with specialist training who are responsible for looking after their patients before, during and after their surgery.